FlashDot is a program for generating and presenting visual perceptual experiments that require a high temporal precision. It is currently used in the Max-Planck-Institute for Mathematics in the Sciences for visual experiments. 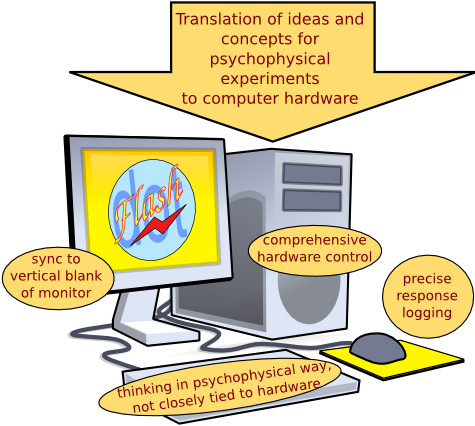 It aims to be an alternative to such popular libraries or packages as the Psychophysics Toolbox, VisionEgg, or PsychoPy. FlashDot is fully functional, but a complete documentation has to be written yet (sorry for that). The provided packages are useful for current FlashDot users; if you are new to FlashDot and would like to try it out but cannot figure out solutions for specific problems, please let me know. A quick overview and introduction by example is provided by the file firststeps.pdf. Some pre-compiled packages can be found on the Download page. Please read also the operation system specific hints below. If you are using another distribution, please get the sources (see below). I provide a MacPorts package. If you haven't installed MacPorts yet on your system, please follow these instructions. Note that you need to install Xcode before (as described there). Download the msi file and double click to install. Important note: Make sure that under your system OpenGL is synchronized to the vertical blank of your monitor. Unfortunately, on some systems this is disabled by default. This can usually be set in your graphics card's OpenGL settings. Have a look at your Display Settings which can be found under Start → Control Panel → Personalization (or Appearance and Personalization → Personalization) → Display Settings → Advanced Settings → (settings of your specific graphics card driver). This concerns only Microsoft Windows; under Linux and MacOS X, FlashDot automatically synchronizes to VBlank. If you would like to test the program but have problems with compilation, please send me an email: tobias-elze (at) users.sourceforge.net. I am looking forward to comments of interested developers and testers. This program is distributed in the hope that it will be useful. It comes “as is”, without any warranty.